Phu Long as well as many other caves on Cat Ba Island in Ha Long Bay is the valuable "tourism resources". Visitors to the cave will have more scientific understanding of the process of formation of limestone caves by the creator, the rise and fall of sea level over the period of geological movement that its mark left behind in ancient sediments or water traces on the cave walls. Coming further into the cave one sees all the beauty and excitement of the art sculptures in natural light vanity lamps, torches. Phu Long cave has multiple layers, gradually rising from the outside like a maze in the place of eternity. The door is narrow, undulating the signs of nature, looking out to the south breezes blowing in from the sea. Over the entrance is an open space, the cave ceiling is low, about 1.5 to 2 meters, the arch was formed by big rocks that runs winding and curving, this first chamber has the structure of a big stone roof, from the ground rises a giant pillar, 1.5 meters high appearing it is trying to push the dome higher. Visit the cave, tourists will have a chance to think about the process of creating a painting as seen traces of the creator hundreds of millions of years ago. From the entrance to the cave there are many layers, formed by stalactites and stone shoots, the main door has the shape of an arch, from the ceilings the stalagmites create a forest of milk pounding the holy water falls. The second cave is a world of the living species. Stalactites form the elephants, dogs, deers, crocodiles, horses...gather at one place. Inside the second cave there are many large roots descending from the top of the mountain, like the natural ladders. The cave dome is high and large, gleaming like it is plated with silver or the sky full of stars, from above the gold mountain, silver streams pouring down. Through the door of second cave is the entrance to the third cave, along the sides are tigers and elephants guarding. To get into the cave visitors have to climb over a big turtle with white stalactites. The centre of the cave is divided into 2 sections, on the left is Heaven Palace, on the right is Buddist Palace. Heaven Palace has golden dragon thrones, statues, day dream goddess with long hair, four holy animals are on the heaven dragon pillar...all are formed by stalactites and the immense imagination of humans. Phu Long cave is also a place to keep the bones of the primitive people, with hiddend mysteries, a pirate refuge of one time. In front of Phu Long cave is a large pond with potential for seafood. Around the cave is primitive forest, vegetation diversity and abundance, including many rare herbs. 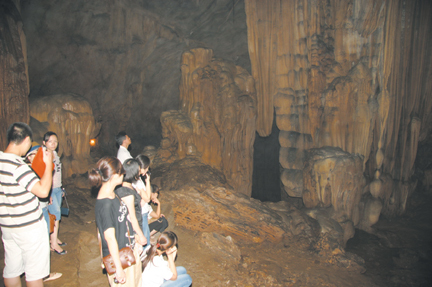 Phu Long cave is an ideal place for the study of prehistoric archeology and ecotourism development. The administration of the Cat Hai district is planning to build infrastructure, general planning of the whole area, protect the landscape and environment, creating favorable conditions for tourists sightseeing.